Bio Compatible Radio opaque catheter for easy insertion, and X ray detection. The Injection Port is provided with specially designed double hinged cap incorporating a recessed plug with a protective skirt to effectively prevent contamination when the valve is closed. The port has one way silicon retreating valve to facilitate extra medication by syringe without needle and to prevent back flow. The valve cap has special design to facilitate two point grip for cannulation. The double hinge port cap design does not obstruct during insertion and fixing and keep the cap closed effectively. 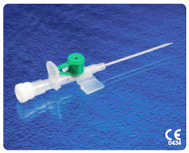 Flexible angled and grooved wings allows easy fixation and prevent displacement of cannula over the patient’s body.